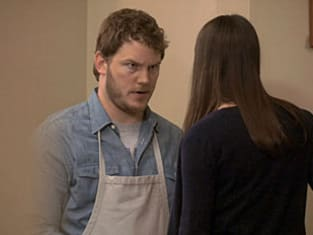 Parks and Recreation viewers reveled in the pain of others on "Indianapolis." There was Ann and her realization that she was dumped a week ago by someone so chipper that she didn't even understand what took place. Among the highlights from this development: Chris' stone-faced explanation of why there's a ladies' razor in his bathroom, along with Leslie's admission that a guy once broke up with her in the shower. There was poor Tommy and his not-so-Fresh idea, which helped incorporate Ben into the group and included the first sitcom scene I can recall that featured one friend dry-heaving over the awful scent of another's self-created fragrance. Someone get that man a Miller Lite! There was Ron and his disappointment over a lack of real steak in the entire city. Need I even type out what made this storyline so ridiculous and hilarious? No? Good. I need to go round up all the bacon and eggs I can find in case Ron stops by later. Finally, there was the one sequence of events that was anything but tragic. 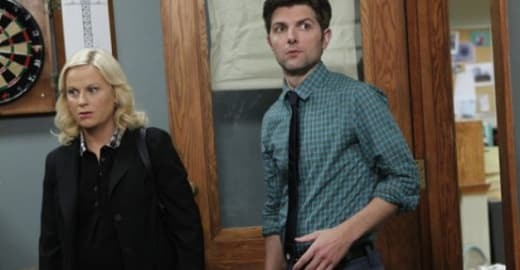 Andy and April bonding over a competition to steal stuff was downright adorable. Because the latter has been so dour over a majority of the series, the smile on her face in the presence of Andy really says everything that needs to be said about these two. That, and the fact that they went all Charlie's Angels when returning the tips to the jar.